January 28, 2019 By Elise Leave a Comment This post may contain affiliate links. Please read my disclosure policy for more info. As a homeschooling mom, convenience is important to me, but so is cost. 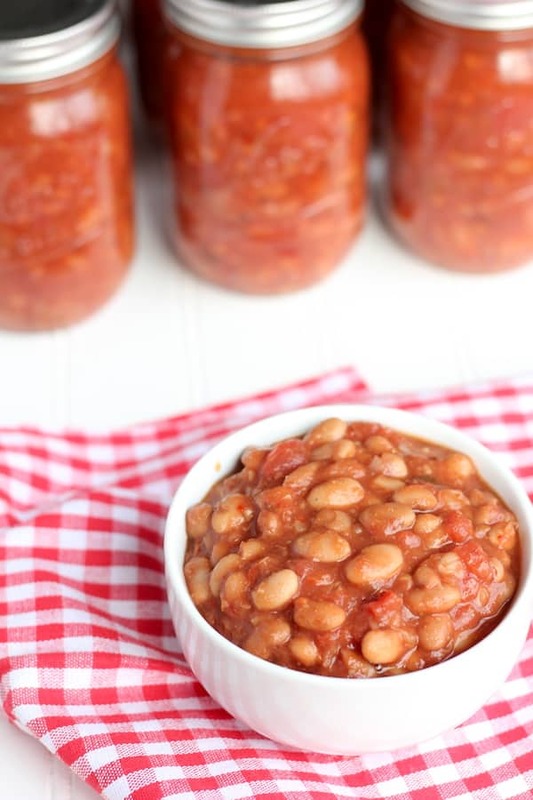 That’s why I’m so excited to share how to can chili beans with you – cost effective, and easy to make a big batch so that you can have convenient cans of tasty beans on hand for weeks to come! I’ve eaten beans my whole life. I grew up growing, drying, canning, and eating beans, got sick of them, quit for a number of years, and came back. And yet, with all that experience of it wasn’t until I was an adult, eating beans because I chose to and not simply because that’s what we could afford to eat as a struggling family in an Amish community, that I really learned how to use beans well. First, I finally learned how to prepare beans in a way that didn’t mess with everybody’s stomachs. Did you know that using slow cooker for cooking beans doesn’t kill the enzyme inhibitors that cause gas? You have to boil them, or better yet, use a pressure cooker. There are also a few other things you can do to really eliminate the negative affects of beans like soaking them and cooking them with bay leaves which you can read about in my article how to de-gas and prepare beans in the instant pot. Just knowing that little tidbit has completely changed my relationship with beans from “love what they add to the meal, hate what they do to my body”, to “let’s eat more beans!”. And it’s one of the many reasons I love to can my own beans. I’ve found that they really are SO much easier on my stomach than commercially canned beans. Another reason is the expense. 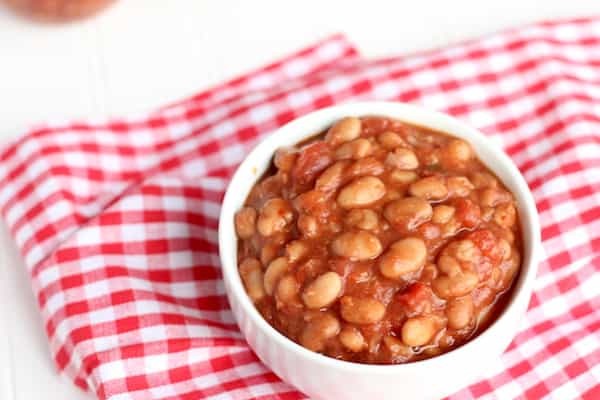 While I wouldn’t say canned beans at the supermarket are expensive, they certainly aren’t as cheap as buying dry beans and rehydrating them yourself, and that’s why I’m so excited to show you how to can chili beans. And they’re easier on your stomach. By canning my own beans, I get the convenience of having cans on my shelves, and the cost and nutritional benefits of cooking from scratch. While I may not be able to can refried beans, they’re super easy to make, and I can make room for them in my fridge and freezer. 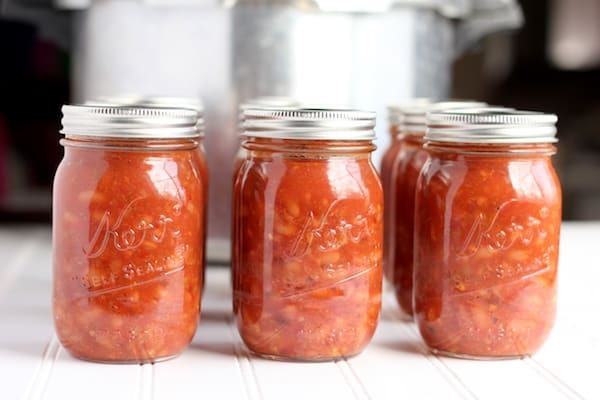 Instead, I focus my canning efforts on things like home-canned baked beans and home-canned chili beans that make true heat-and-eat convenience foods. I first decided to try canning chili beans on a whim. I knew vaguely how to can chili beans, but I’d never done it before. I did know however, that I love having cans of chili beans on my pantry shelf to dump into a pot of chili – they’re so convenient and tasty! – I just didn’t like the expense or waste of tin cans. I also decided to can these beans with enough chili sauce so they could serve as vegetarian chili by themselves if I didn’t want – or have time – to brown ground beef or pork to go with it. I think you’ll find these beans are pretty darn good all on their own! 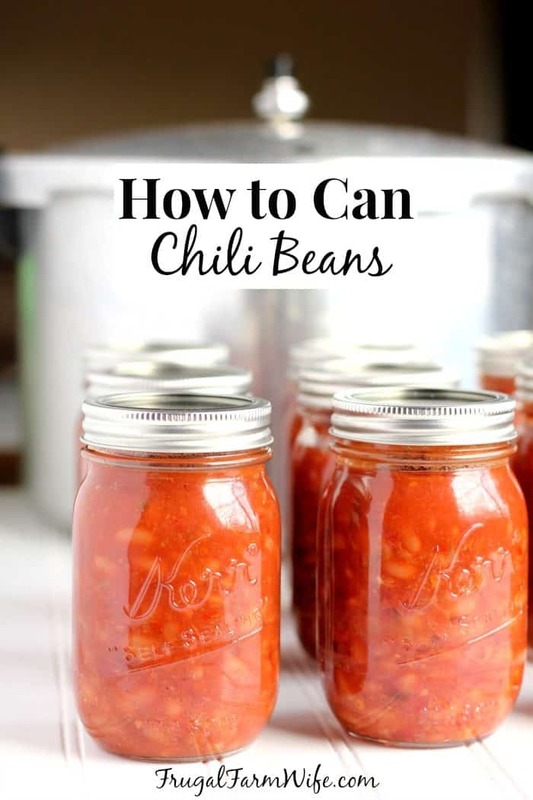 And finally, before we get going on how to can chili beans, you might be wondering, knowing that we live in a small – even tiny – house, a super old, remodeled mobile home, where in the world I keep my canned goods. I am fortunate to have more pantry shelving than most mobile homes allow thanks to the setup of the laundry room and my husband’s shelving skills (He says they’re just throw-together temp shelves a he’ll get around to making “good” ones sooner or later, but I like them as they are! ), but I also store canned goods under beds. I’ve found that pint jars fit well under our bed, and quarts fit nicely under the kids beds which are slightly higher off the floor. 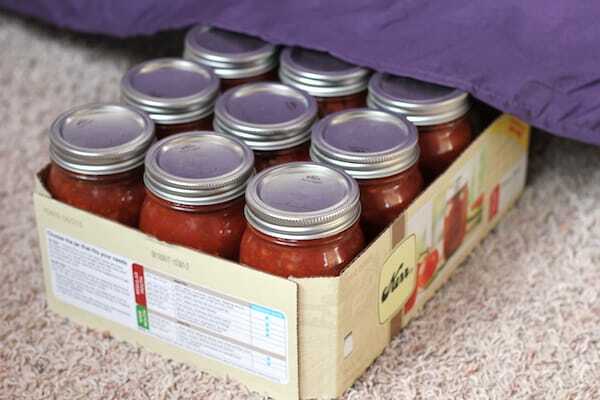 It’s kind of funny storing food under everyone’s beds, but if it works, it works. Add pepper and more salt to taste if needed. Add rack. This is important! You want some water between the bottom of the canner and the jars. Your canned chili beans are now ready to store and be put to work!